Cost: Tickets for adults over age 13 are $23. Children from ages 5 to 12 are $15. Children ages 4 and under are free. Operating Seasons and Hours: Open from 9:00 am to 5:00 pm every day of the year except Thanksgiving Day, Christmas Eve, Christmas Day and New Year’s Day. This was the first stop of the fourth day of my family's road trip to the Lookout Mountain area of Alabama in April of 2016. Huntsville is not really in the Lookout Mountain Area. 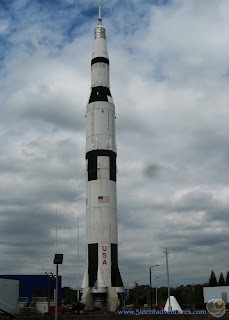 However, we really wanted to see the Rocket Center and so I added it to our itinerary. I figured this might be the closest we'd ever get to Huntsville while we lived in Alabama. So we drove the 80 miles from Fort Payne to Huntsville. Remember the movie October Sky, about a group of teenage boys who learned how to make small rockets in the 1950's? Throughout the movie the main character, Homer Hickam, wishes he could be in Cape Canaveral, Florida designing rockets alongside his hero Dr Wernher von Braun. What Homer didn't know was that Dr. von Braun wasn't working in Cape Canaveral. He was really in Huntsville, Alabama. It was in Huntsville that Dr. von Braun and his team developed the mighty Saturn V Rocket that took men to the moon during the Apollo program in the 1960's. They worked for NASA at the Marshall Space Flight Center. As the Apollo program was winding down, Dr von Braun helped create the US Space and Rocket Center which opened in 1970. This place was designed to showcase all the amazing technology that the Marshall Space Flight Center had created to put men on the moon. Over the years the complex grew and more pieces from the history of space exploration were added to the collection. I decided that my family should visit the US Space and Rocket Center while we lived in Alabama. I have a special place in my heart for the 1960's space race. My dad grew up during that time, and read all about it as an adult. When I was young my dad would tell me stories about the history of the space program. I developed my own interest in the Space Program. 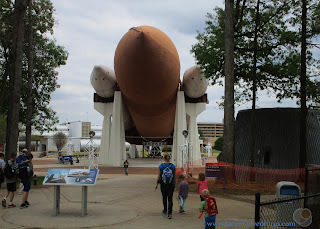 Visiting the Rocket Center would be a fun way to see the things that my dad and I had read about. 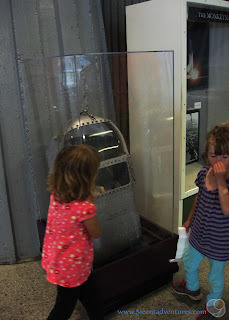 That love for history made me okay with paying quite a bit of money for our visit to the Rocket Center. 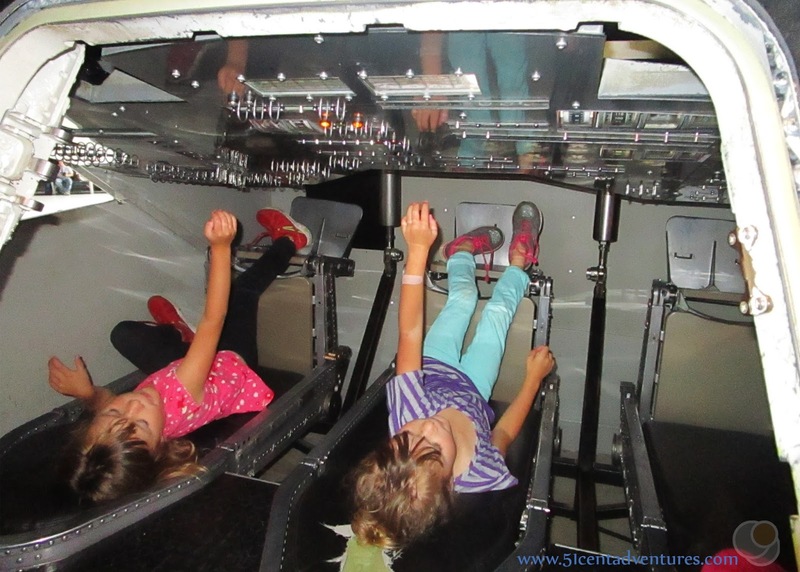 At $23 for an adult ticket and $15 for a child's ticket, visiting the Rocket Center was almost out of our budget for my family of six. However, my husband got in for free since he is an active duty military member. And our younger two children were under 5 so they also got in for free. That meant we only had to pay for my ticket and two tickets for our five year old twins. That brought the total to $53 which was still expensive, but more manageable. We could have added some IMAX movie tickets onto the price of admission, but I didn't want to pay any extra money. When we started walking around the Space Center I wasn't sure if paying that money was the best thing we could have done. All the displays in the main museum building were underwhelming. I'm not kidding, there was an entire room displaying space themed jewelry. I was thinking, "we paid $53 dollars for this?" But after we made it outside and into the other buildings we started to see things that were of greater historical importance. Still we spent a lot of time wandering around and seeing things that really weren't that historically important. I kept wishing I had a list of the most interesting things to see from a historical perspective. I've decided to make that list for you. That way you don't have to spend time wandering around wondering where the good stuff is. So here you have my list of the Top 10 amazing exhibits at the US Space and Rocket Center. The US Space and Rocket Center owes its existence to Wernher von Braun. Starting in 1950 Dr. von Braun led the rocket development team at the US Army's Redstone Arsenal located in Huntsville, Alabama. Later they would develop and build the Saturn V rocket that took men to the moon in the late 1960's. 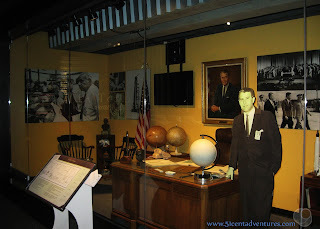 A display of von Braun's office the way it looked during the 1960's is set up in one of the hallways of the main museum building. There are two large rockets that tower above the buildings of the rocket center. Both are visible from the freeway as you approach the center. One rocket is a Saturn IB rocket and the other is a mock up of the Saturn V rocket. This rocket on display isn't a real Saturn V rocket. It's a full size mock up that was built in 1999 to commemorate the 30th anniversary of the Lunar Landing. Even though its a "fake" it is very impressive because it gives you an idea of what it would have been like to stand near the real rocket. The Saturn V Rocket on display on the second floor of the Davidson Center was the first full scale Saturn V rocket ever built. It was never intended for space travel, but was used to test how the rocket would preform during the shaking that happened during launch. Even though this particular rocket wasn't built to be launched into space it is still a marvelous monument to the space race. 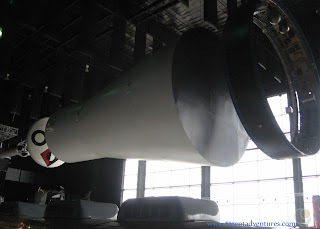 The rocket is displayed on it's side, and runs the length of the giant building. The rocket is supported 10 feet off the ground. As you walk under the rocket you can see the different stages that made up this impressive feat of engineering. All the way at the front of the rocket is the spot where the Command and Service Module would have been. Since this was just a test rocket it didn't have a real command module or service module. Instead there is just a mock up. 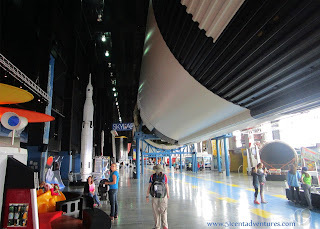 At the far end of the Saturn V Hall is a very special display. 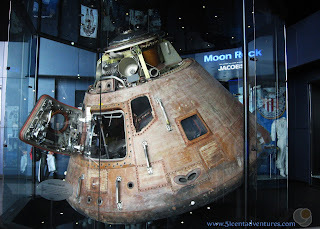 The Command Module from Apollo 16 sits encased in a glass display case. 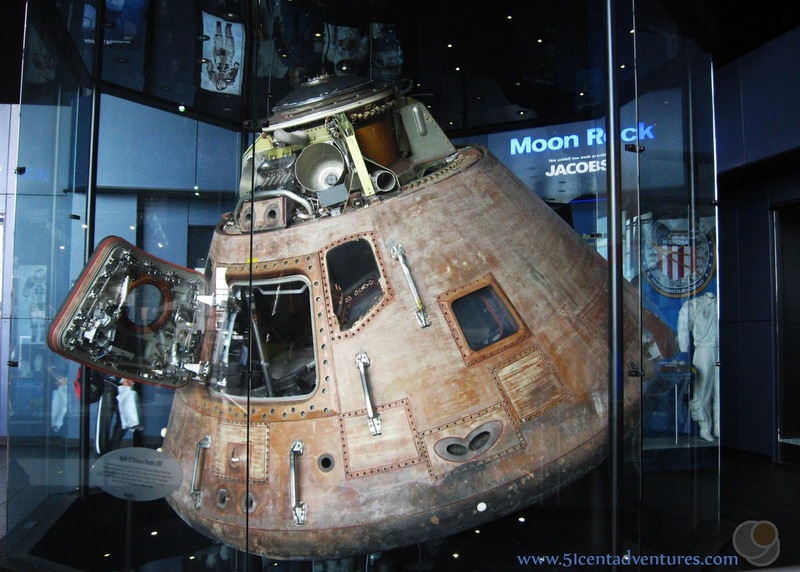 The Command Module is where the three astronauts would ride during the launch, space travel, and re-entry to earth. This is the only part of the rocket that would come back to earth. For those of you who are fans of the movie Apollo 13, this particular Command Module was piloted by Ken Mattingly. A mock up of the Lunar Excursion Module (LEM) sits on display opposite the Command Module. This is what the ship that landed on the moon looked like. 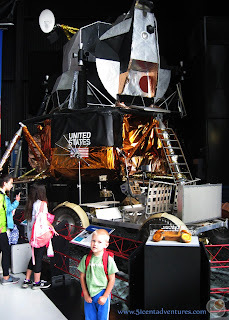 Two men would take this ship down from the Command Module to the surface of the moon. This wasn't one that was used though, since all the ones that were really used were left in space. 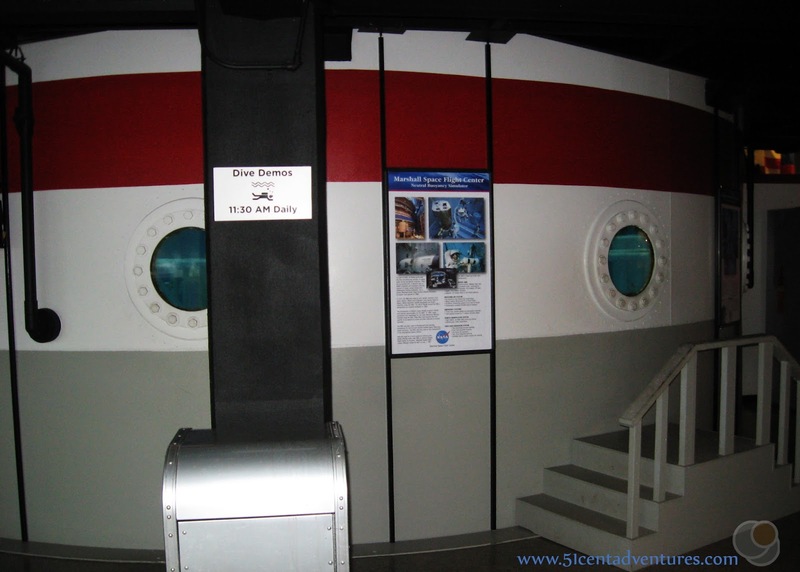 One of my favorite parts of the Saturn V hall was the Command Module Simulator. This was an actual simulator that the astronauts used to train for their trips to the moon. I was amazed that we were allowed to climb inside. 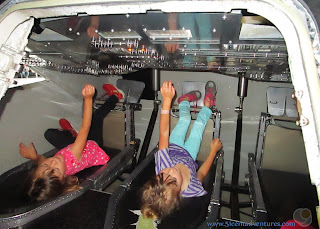 My girls loved laying in there and pretending they were in the rocket ship. We'd watched Apollo 13 in the car on our way to Huntsville that morning and it helped them have a greater understanding of how cool this machine was. Of course I had to jump in the simulator as well. This picture right here was worth the price of admission to the Rocket Center. 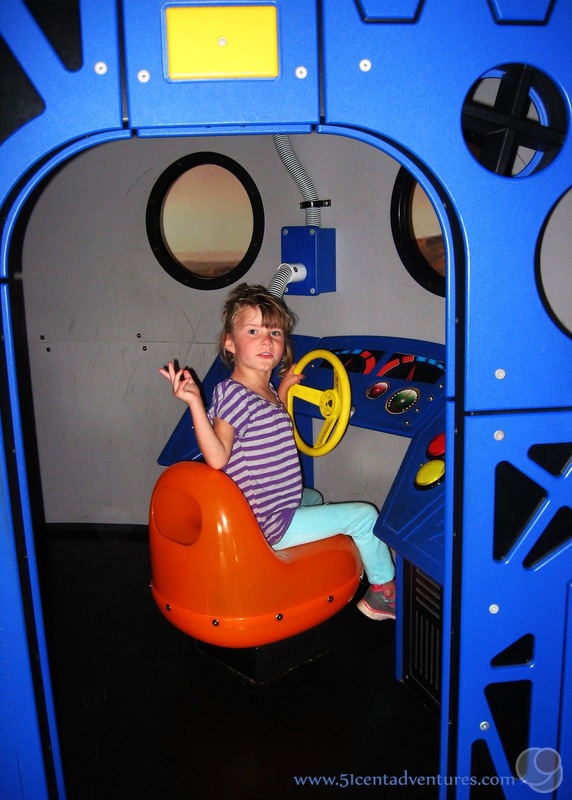 In addition to this training simulator you can peer inside the simulator used to practice piloting the LEM. The shuttle on top of the stack is named Pathfinder. It's not a real shuttle as it was never intended to go into space. 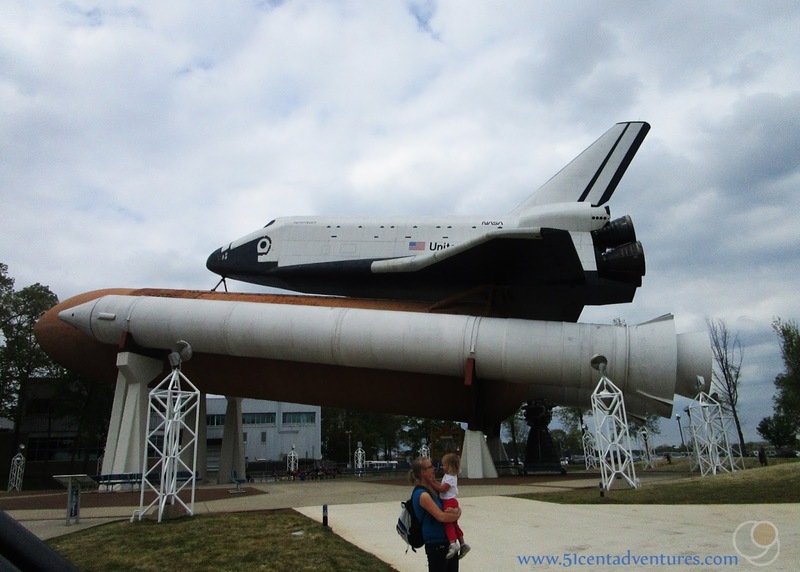 Instead it was built to test equipment that would handle the real space shuttles. It was originally the same weight as a real space shuttle, and was just plain white. After it was no longer used as a test shuttle, it's weight was lightened and it was painted to resemble a real shuttle. The External Fuel Tank is also a mock up, but the Solid Rocket Boosters (SRBs) are real. The Space Shuttle Program was different than the Apollo program in that the shuttle, the fuel tank and the SRBs were collected and reused after every launch. This is a fun little piece of NASA history. Astronauts used this water tank to experience what it was like to move in a weightless environment. This tank was used to train astronauts up until 1997. It was moved from the Marshall Space Flight Center to the US Space and Rocket Center. Visitors can see demonstrations inside this tank every day at 11:30. In 1959 two monkeys were part of the space program. One named Miss Baker was the first animal that the US successfully sent into space. 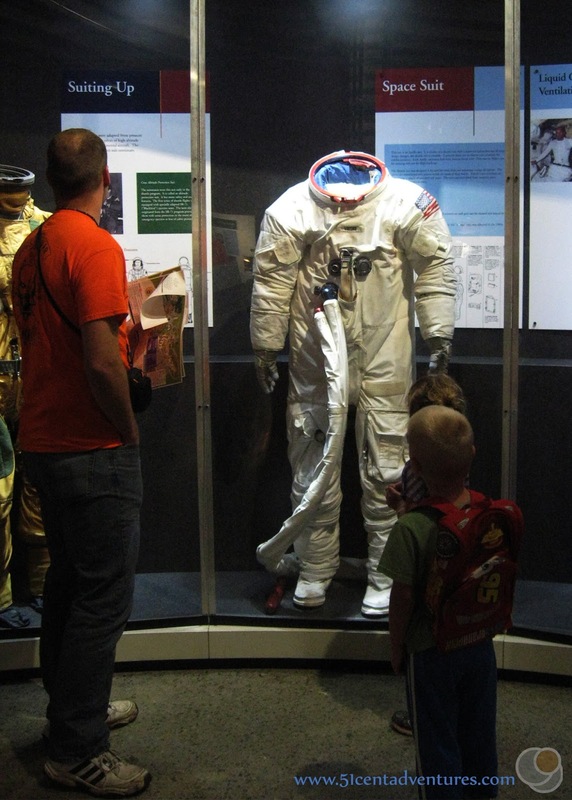 Her "Mankeynaut" Capsule is on display in a hallway between the Space Camp Museum building and the main museum. When I was little my dad would read me a children's book called The Monkey in the Rocket. This book was based on the real monkeys that were sent into space. Seeing the real capsule that was used in the program was a fun little surprise for me. Miss Baker is buried outside the entrance to the Space and Rocket Center where a headstone marks her grave and details her accomplishments. 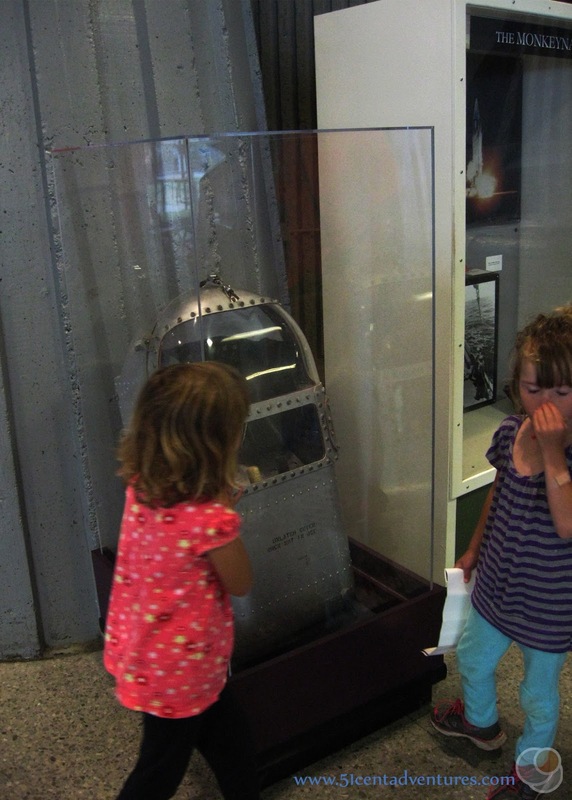 So there you have the top ten historical things that you should check out at the US Space and Rocket Center. However, those are hardly the only things to see. I've added a few honorable mentions to this list. Tucked away in an upstairs part of the main museum is a room with an exhibit of things used during the space shuttle era. You can view many pieces of equipment that were used during the Space Shuttle era of space exploration. I wish this room was in a better location, maybe near the shuttle stack display. Maybe now that the space shuttle program has ended these things will be moved into a more prominent exhibit. The US Space and Rocket Center has been home to Space Camp since it's inception in 1982. Thousands of children, teenagers, and even adults have been able to experience life as an astronaut. There are several buildings at the complex which are only for people participating in Space Camp and so are off limits to the general public. But one building is a museum of sorts. 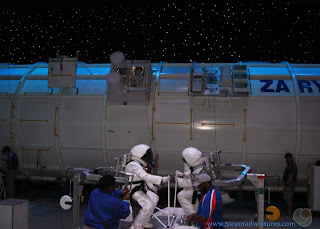 In it you can watch people as they pretend to train for missions in space. Outside the building are some amusement park rides that are used to demonstrate some of the physical feelings you have as an astronaut. One ride is a Space Jump which launches people up like a rocket taking off. The other is a G-Force accelerator. 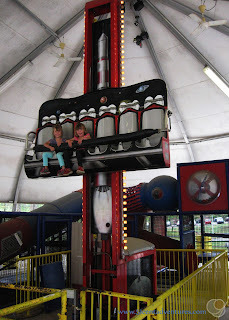 These are included in your admission price and you can ride the rides as often as you want. If you asked my kids what their favorite part of the whole US Space and Rocket Center was they would probably tell you it was the play house. They spent quite a bit of time playing in here pretending they were exploring space. This was really convienent because my husband and I could take turns keeping an eye on the kids while we went to explore the rest of the building. It was nice to have time to look at things without four bored kids asking to move onto the next display. 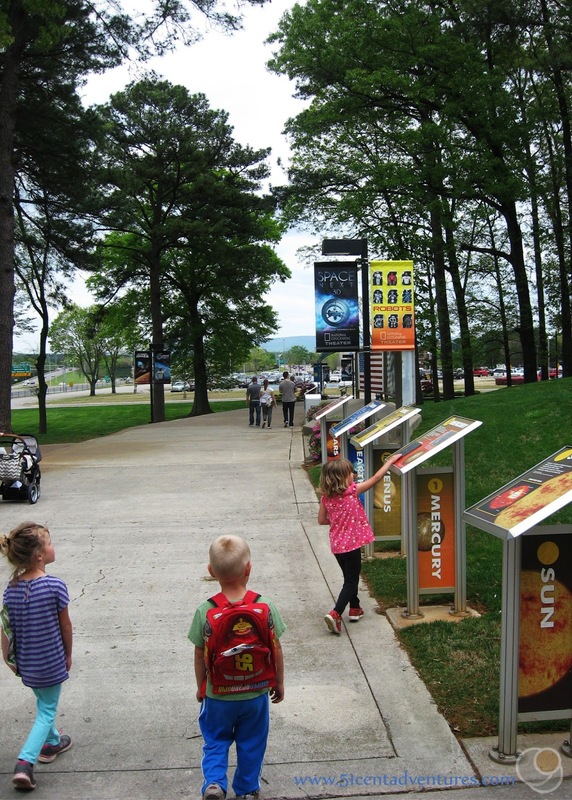 As you enter and exit the rocket center you will pass a scale model of the solar system. Even though we were exhausted from our time inside the center, the kids still had fun seeing how far each planet was from the sun. Pluto was way out in the parking lot. It was farther away than even our car. 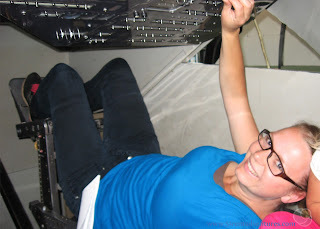 Recommendation: A visit to the Space and Rocket Center is great for any space buff. The Saturn V Hall in particular is full of tons of things left over from the 1960 era of space exploration. 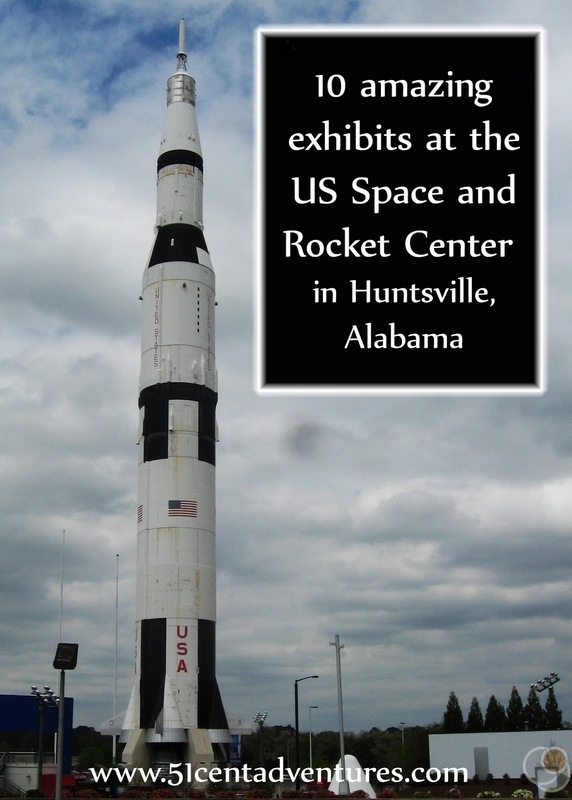 Directions: The US Space and Rocket Center is located on the south side of I-565 in Huntsville, Alabama. Take Exit 15 off of the interstate. Just look for the many rockets on display and follow the signs. Additional Information: While we were visiting the US Space and Rocket Center I kept wondering what the Marshall Space Flight Center was like. Pretty much everything that was on display had been developed at that facility. Was it possible to tour the Marshall Center itself? Later I found out that it was possible to take a tour of the Marshall Center. Tickets are $15 for anyone over the age of 4. Children age 4 and younger can go on the tour for free. You buy the tickets at the Space and Rocket Center, and then you board a tour bus that takes you to the Marshall Center. The tour is done entirely while riding the bus with a trained presenter pointing out areas of interest. There is only one tour per day. It departs at 12:30 every day and lasts about 90 minutes to two hours. I don't know if I would have paid to go on this tour with my young children. But it's nice to know its an option if we come back to the rocket center when they are older.